The third chapter of our video, talking about historical and archaeological research and virtual reconstruction of a medieval calstle. This time we are surveying the castle hill by our DGPS system. The second chapter of our video, talking about historical and archaeological research and virtual reconstruction of a medieval calstle. This time we are locating the site and finally going to work. The Castle of Torre dei Sicconi (Tower of the Sicconi clan) was destroyed by troops from Verona and Vicenza in 1385. For that reason we don't know how the building looked like in the Middle Ages. One way to learn more about the original shape of the complex is reading historical sources which are speaking about the Torre dei Sicconi castle and it's single parts. The Castle of Torre dei Sicconi (Tower of the Sicconi clan) is situated on the foothills south of the village of Caldonazzo. It was founded in 1201. The castle was destroyed by troops from Verona and Vicenza in 1385. The Cultural Heritage Department of Trento (office of archaeological heritage) has conducted excavations and restoration works between 2006 and 2008. That data was used for a virtual reconstruction of how the castle may have looked like 600 years ago. The rebirth of a lost castle. We start today with an appetizer: The 90 seconds long trailer of the project. 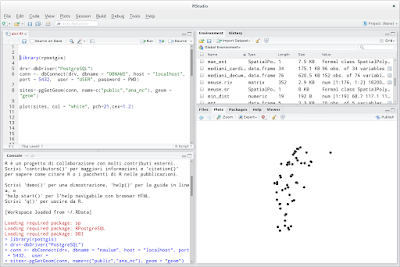 Just a short post to spread the announcement of the recent release of two R packages: rpostgis (see also here) and RQGIS (see also here and here). 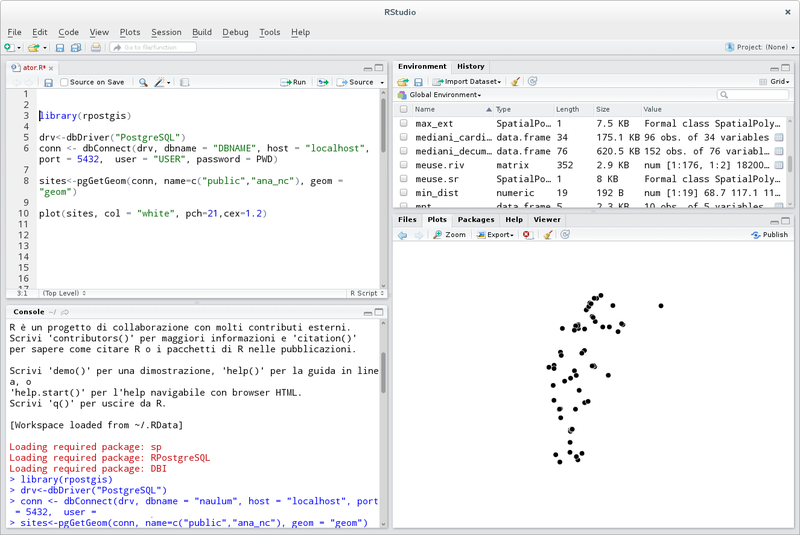 The first facilitates transfer between PostGIS "Geometry" objects (stored in PostgreSQL databases) and R spatial objects; the latter establishes an interface between R and QGIS and allows the user to access the many QGIS geoalgorithms from within R.
I tested them briefly and I think they are very useful tools to perform and simplify statistical and geo-statistical analyses in archaeological contexts. Here I present a quick example of usage. Firstly I imported a set of archaeological site-points stored in a PostgreSQL/PostGIS database. 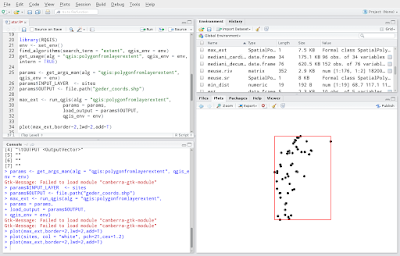 That is very simple with rpostgis package: it's enough to create a database connection (like in RpostgreSQL package) and launch the "pgGetGeom" function. 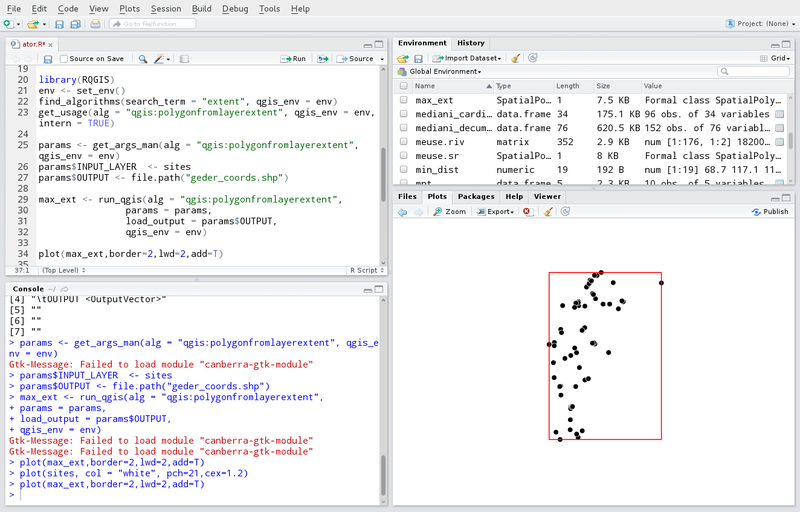 Then I used RQGIS package to run (within R) the QGIS geoalgorithm that builds a polygon from layer extent. After setting the same parameters required by QGIS, the function "run_qgis" creates a red polygon around the outermost points of my dataset. Actually, must be careful to the version of QGIS we are using. With 2.14 there's no problem, but if you're using 2.16.1 or 2.16.2 (like me) you must modify the QGIS file "AlgorithmExecutor.py" (path for linux users should be: "/usr/share/qgis/python/plugins/processing/AlgorithmExecutor.py") as described in the web page. In the next future this problem should be correct by QGIS core team. 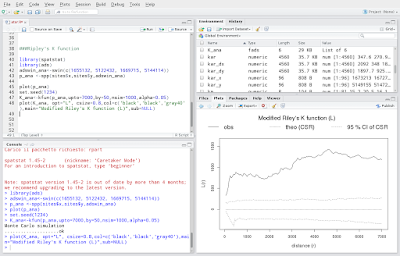 At the end I performed a specific point pattern analysis with the data imported and created by our two packages: in this example I calculated the Ripley's K function (for an archaeological example see here) in order to identify the distribution model (random, regular or clustered) of my archaeological sites. 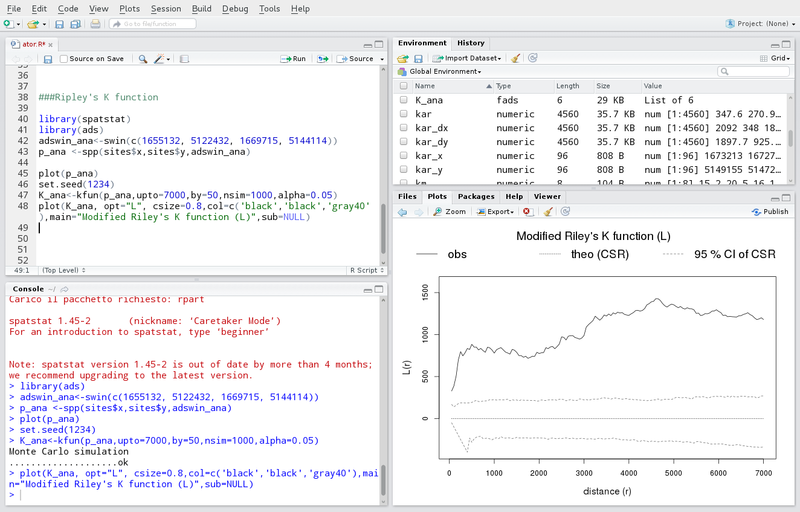 In my opinion these two new R packages make easier and faster the traditional spatial analyses in R and facilitate a more virtuous integration between GIS, geo-database and statistics. We have recorded hours of movies during our diving project in the Mandrone lake. Later this year we will publish a video illustrating us while we are working over and under the water surface.